The role of the DVN would be to help owners that are unable to visit the vet due to their own health or disability. A “fringe” event on District Veterinary Nursing will take place at BVNA Congress on Saturday (13 October). The District Veterinary Nursing (DVN) session aims to showcase the role and challenges through a series of short presentations and case studies. Speakers will explore: ‘What is a DVN,’ ‘Developing the role of the DVN,’ ‘Supporting the Human-Animal Bond’ and ‘professional considerations now and in the future’. At the end of the session, delegates will be invited to discuss the role of the DVN through an informal forum led by Dot Creighton RVN. DVN is a new movement which has been gaining momentum over the past few months. 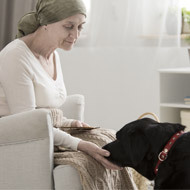 Founded by RVN Carla Finzel, it encompasses intensive care nursing, specialist clinics, palliative care and owner support and mentioning - all under the direction of the referring vet. Earlier this year, the District Veterinary Nurse Development Group was established to support Carla to help develop the role at a national level. Formed by volunteers, the group is rapidly gaining support from eminent members of the profession, RVNs aspiring to be DVNs and clients in desperate need of the service. It has also received backing from interested parties and organisations who can see the impact the role could have in society. In a press release, the DVN Development Group said: “There are many reasons why owners do not visit the vet - it may simply be that the pet is fearful or in more complex situations where the owner is unable to give veterinary care required due to their own health or disability. The session is open to all attending BVNA Congress at no additional charge and takes place on Saturday, 13 October at 3.30pm.